What Melissa is saying about our wall decal.. I am a really big fan of vinyl wall art. The first set I ever got was when I was pregnant with Big Broalmost 15 years ago. It was a Looney Tunes set and I decorated an entire wall in his nursery. It was adorable! Through the years, I’ve decorated other parts of houses we lived in with vinyl wall art and I’m still a huge fan. Nowadays, there are so many different choices, styles and companies that sell vinyl wall art. But when I came across Wallstale.com, it was like no other I’d seen before. I browsed there site and just continuously fell in love with everything that I saw. Many things are tailored more towards babies and kids, but colors are all customizeable, so if you have the vision, it can be done! First I just adored the birch trees on the top left of the photo below. I thought they would look perfect behind my headboard. Sadly, that wall is slanted though so I just wasn’t sure it would work. Then I saw the family tree and I was smitten. That was the one – I swore it would be mine! I had to measure my wall to see if it would fit, but it wouldn’t. So I measured another wall and it was still too narrow. The only walls it would work on is in the kitchen, my room or the kids’ rooms – not places I wanted it to go. My search continued and I came across the trees with owls. Of course I wouldn’t have chosen pink, but the hubby was not having it. I tell him all the time that he is just too opinionated and he needs to give me full reign to decorate how I choose. After all, I am the woman and he is the man. 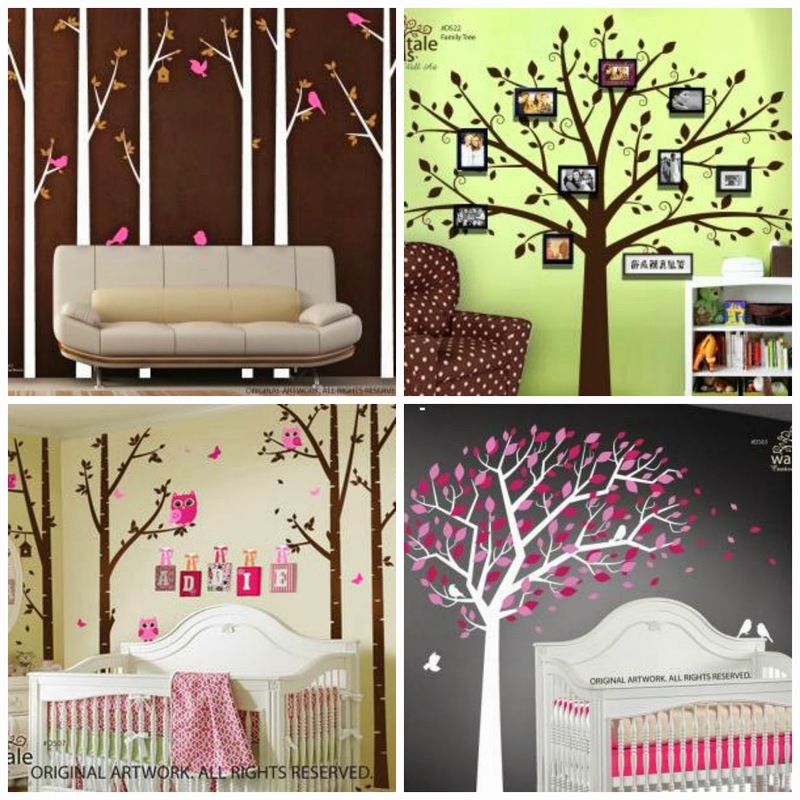 In the end we ended up both agreeing on the Large Tree Wall Decal with Blowing Leaves for our family room. It turned out wonderful! I was a bit intimidated when it first arrived because I realized that each little branch and leaf was individual. I knew it would take awhile so the hubby and I waited until a day when we had a few hours to spare. He wasn’t very “helpful”, so I had to stop halfway through and go back to it the next day. I decided that I wanted some leaves blowing over the window and then some falling down to the ground. That’s the beauty of this specific piece, because I got to do whatever I wanted and make it totally unique to us. It totally completed this wall that we were unsure of what to do with. It’s just an empty 6 feet of space because it’s next to the fireplace and you don’t even really see that section of the room unless you’re sitting right in front of the TV. The staff at Wallstale.com went above and beyond in helping me choose the perfect color combination. I originally wanted yellow and light brown and I’m so glad I went with the golden yellow and red instead. I am beyond happy with my wall art and will definitely be making a purchase from Wallstale.com in the future!